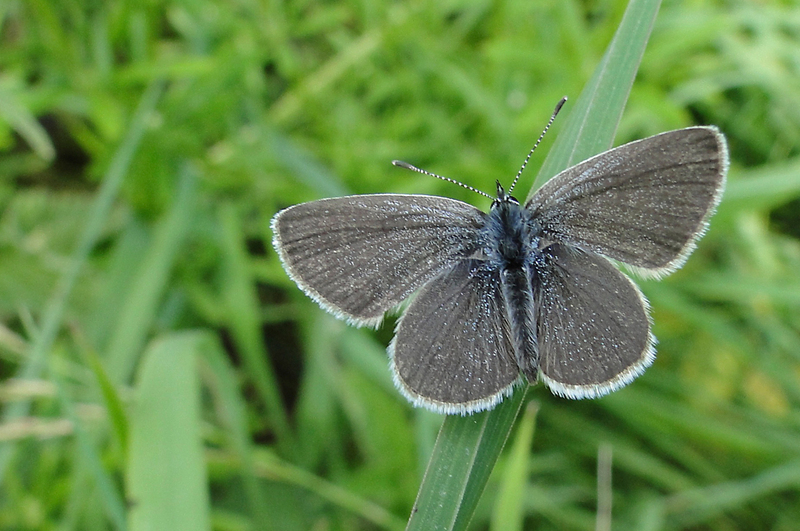 When I saw my first Small Blue Cupido minimus I was surprised at just how tiny it is. The wingspan of our smallest butterfly can be as little as 16mm, so it’s well named. It’s rare though, being no more than locally common even in its strongholds of Gloucestershire, Wiltshire, Dorset and the Isle of Wight. Here in Wiltshire up on Morgan’s Hill I’ve only come across it in one sheltered spot and even there it’s largely confined to the base of one steep bank. But then it’s a very colonial butterfly. Typical colonies contain perhaps just 30 adults or so and breed in the same patch for generation after generation. Larger colonies do occur of course – one large wildlife reserve I visited last May had good numbers, many hundreds in fact, but sites like that should be regarded as the exception rather than the rule. The males like the one pictured above spend much of the day sunning themselves with their wings half or fully open. Perched on low vegetation they wait for passing females to intercept making them relatively easy to photograph if you can get close enough. After mating the females leave the males to feed and lay eggs on the host food plant, the yellow flowering Kidney Vetch. The male is a smoky-greyish browny black with a scattering of petrol blue scales at the base of the forewings. Whilst the underside is a silvery-blue, peppered with black spots. The female is similar but has no blue on the forewings.